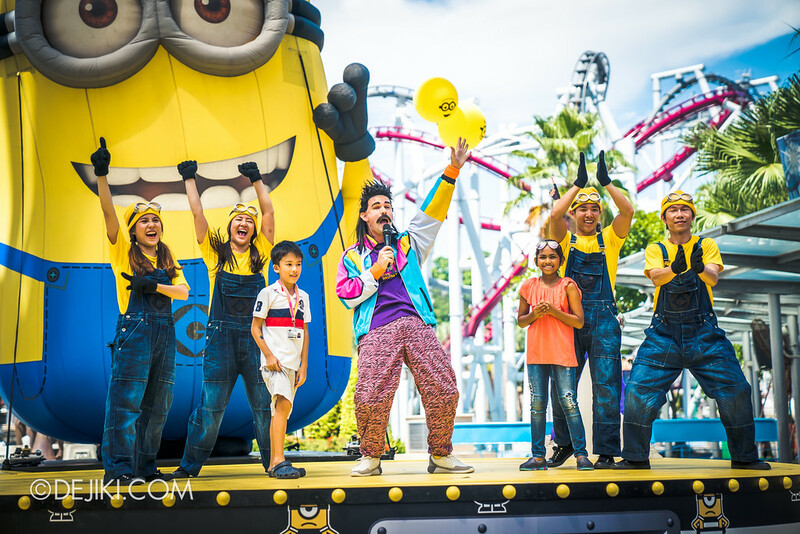 Dance, play and laugh with the Minions at Universal Studios Singapore’s all-new Despicable Me: Breakout Party event! 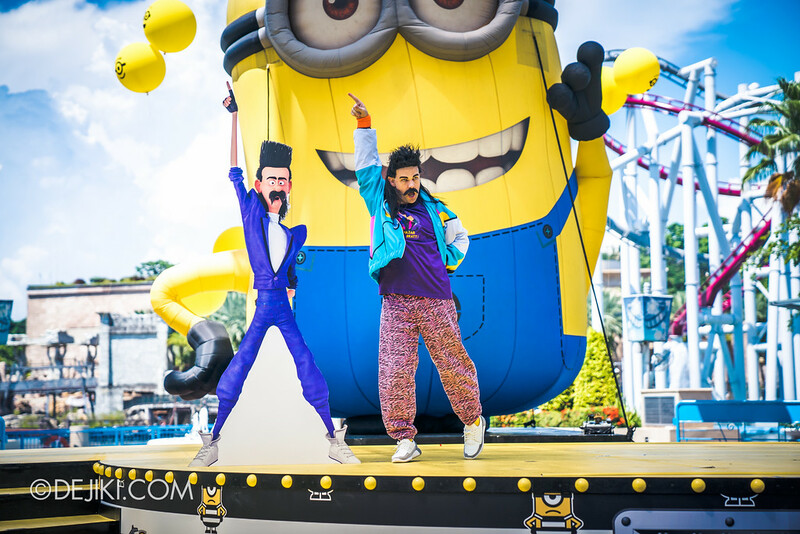 From 15 June to 20 August 2017, Universal Studios Singapore will be holding the Despicable Me Breakout Party, a Minion-themed event to celebrate the release of the new Despicable Me 3 film! 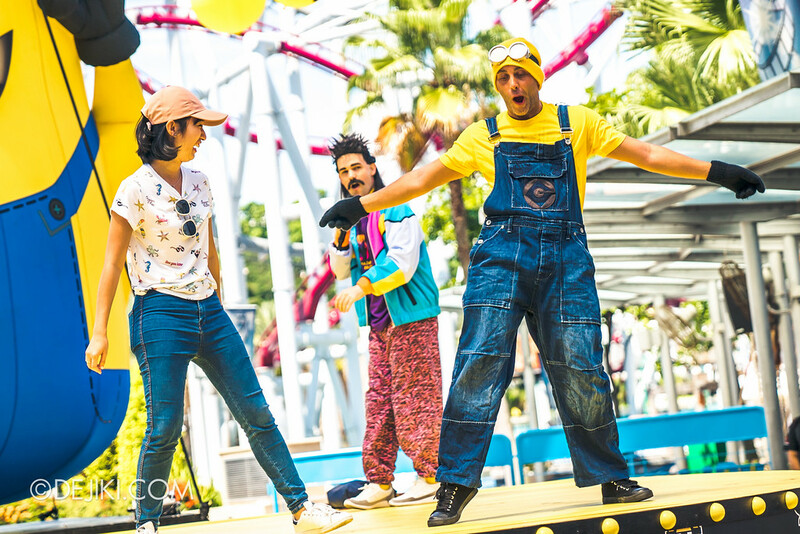 The Minions have taken over the Hollywood zone of the park, setting free fun and cuteness along the Boulevard. 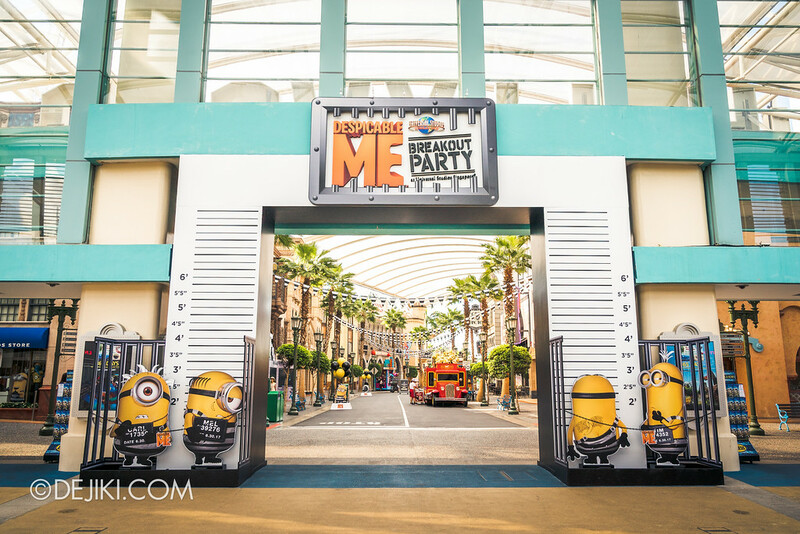 Despicable Me Breakout Party – What is it? 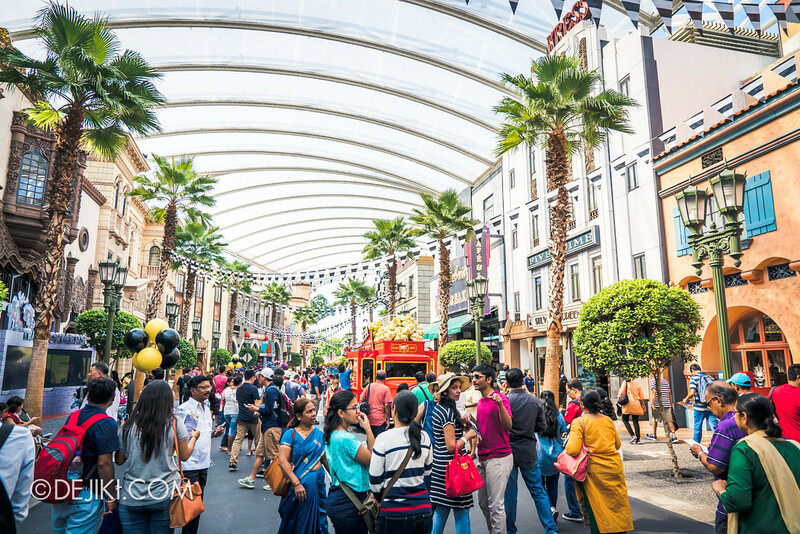 Admission to this event is included in park admission. From now till 31 July 2017, grab the special USS Summer Bundle online at S$76. 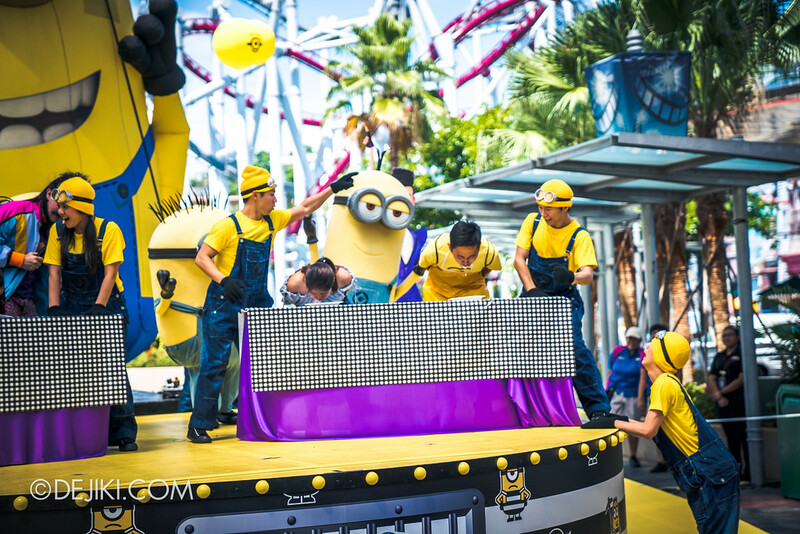 It includes a one-day (Adult) pass to the park , $5 meal voucher, $5 retail voucher, and a $5 Minion Game stall voucher! Watched the latest film? 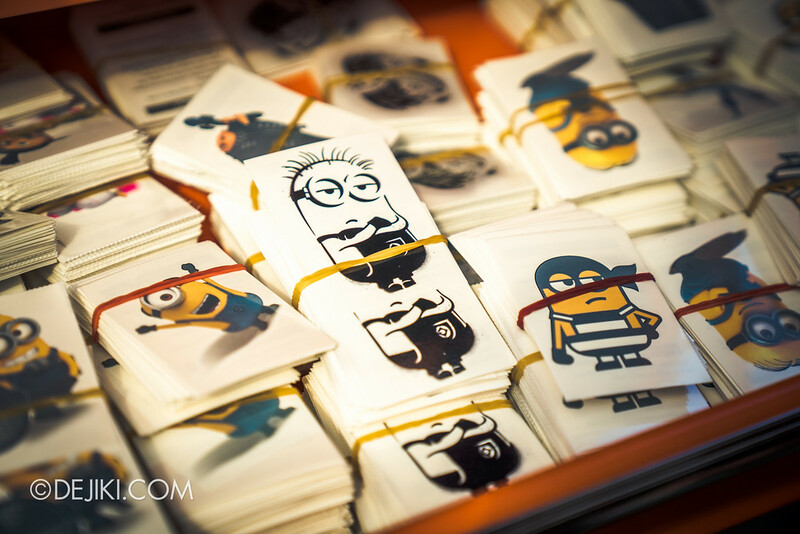 Keep your ticket stubs from the Despicable Me 3 movie! 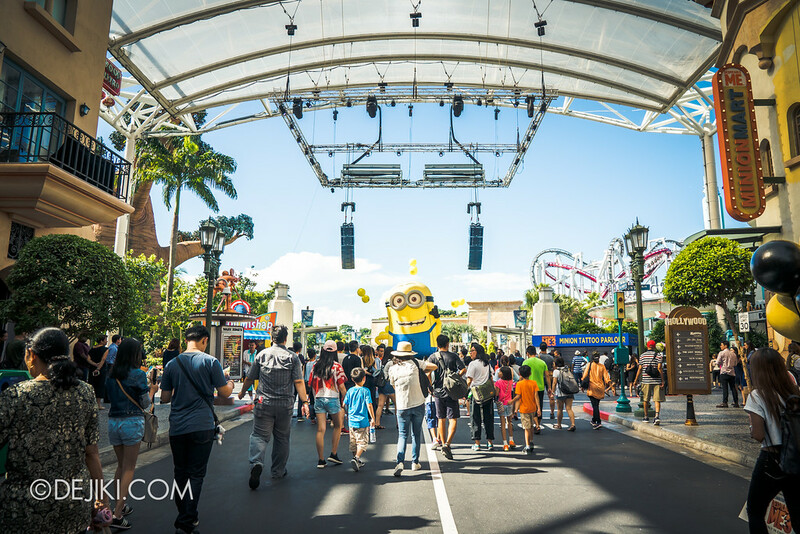 Present them to the USS Ticketing booths and enjoy $8 off One-Day (Adult) tickets and a free S$5 USS Retail Voucher (min. spend of S$35); and a free treat with every purchase of One-Day (Child) ticket. 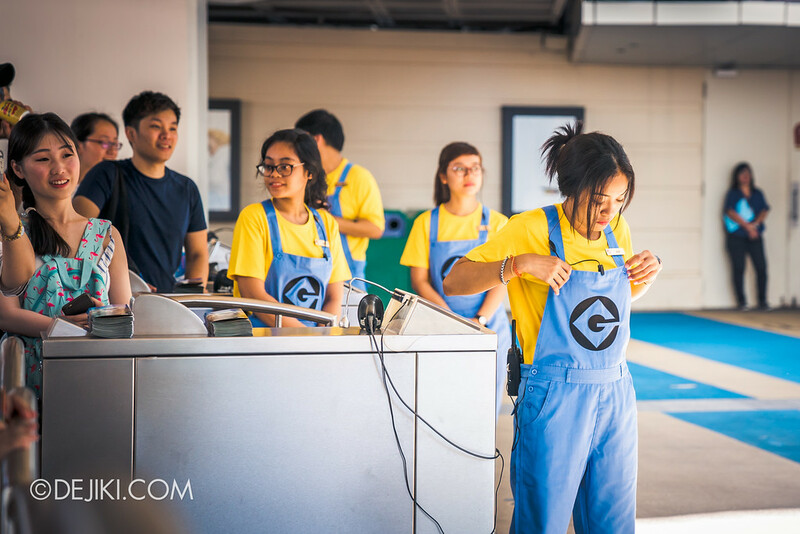 Even the park’s entry operations crew are in Minion overalls! Striped buntings for that jailbird carnival feel. 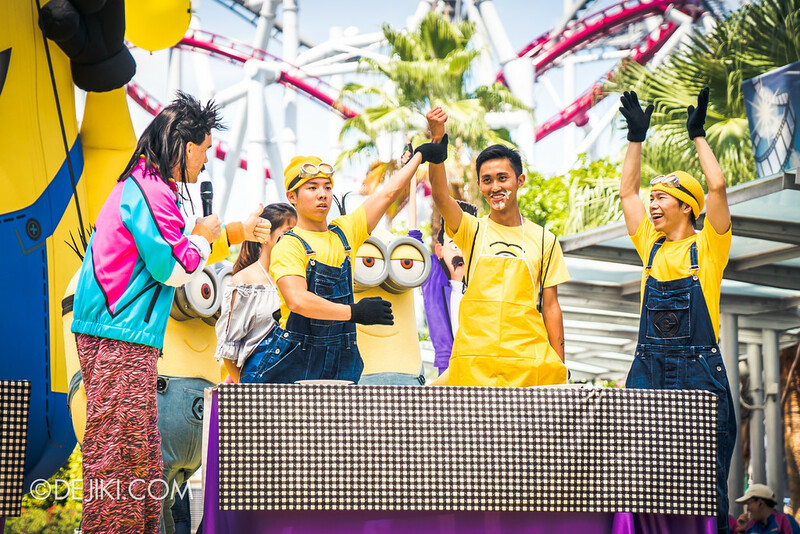 A 5-metre tall giant Minion is the highlight at the Lagoon Stage for this event! 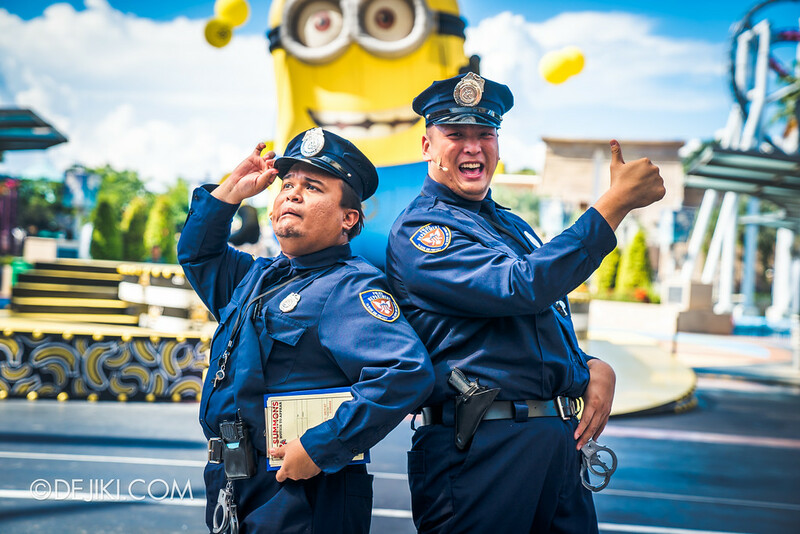 To curb the unruly spread of cuteness and yellow things in general, police officers are now patrolling Hollywood, issuing summons to visitors who have made the park too happy. Wow, Hollywood feels so much safer already. 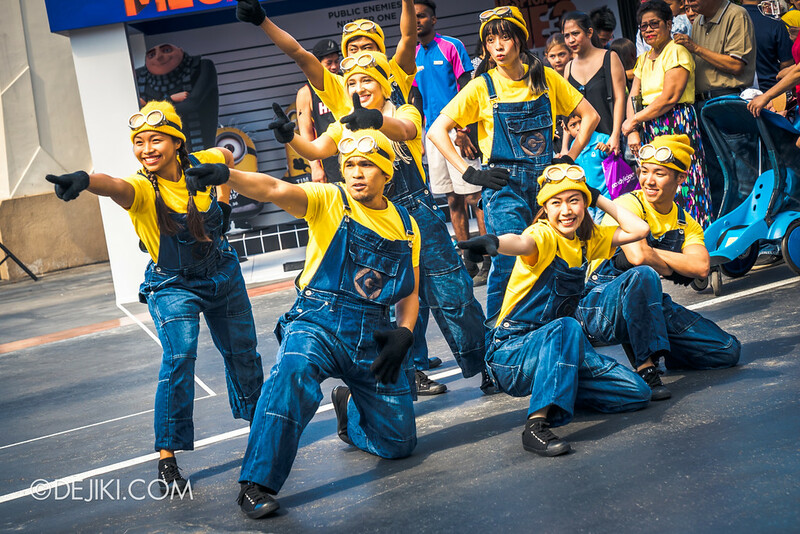 Somehow a mob of Minions appears and breaks into dance, including the jailbirds! 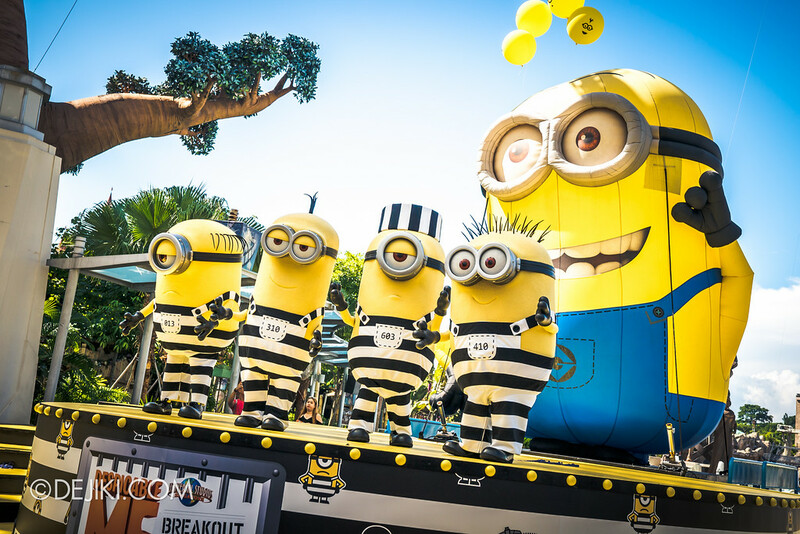 Stay back after the Minion Mob, because it’s photo op time with the Jailbird Minions and Police Officers! 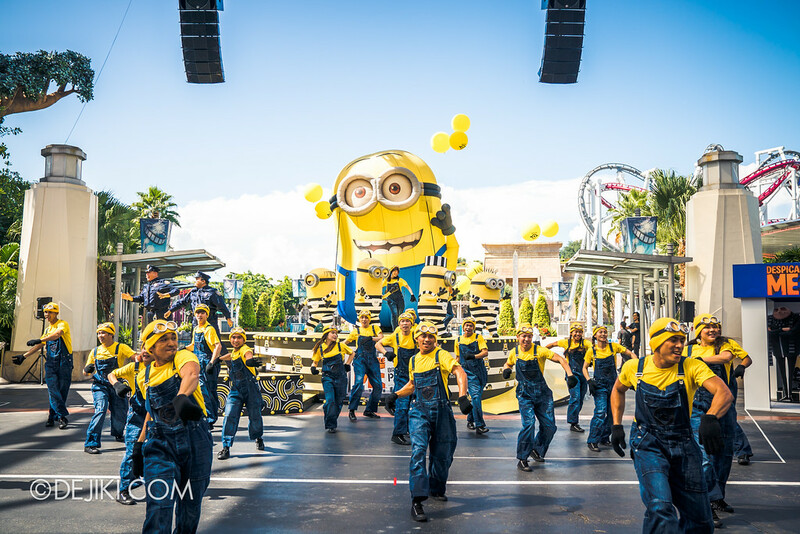 The Minions have asked that I keep their flash mob plans a secret. 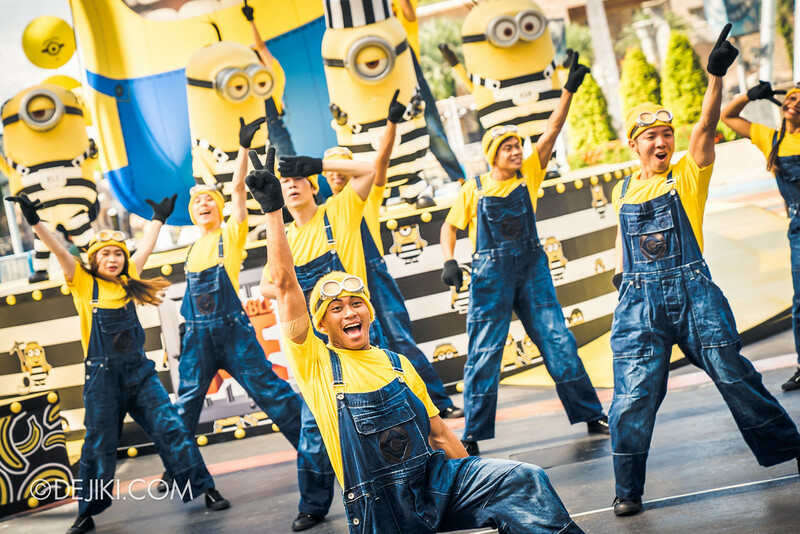 This ‘surprise’ show is performed in the afternoon – perhaps when you are at the park you can get more information. Got any dance moves to show off? 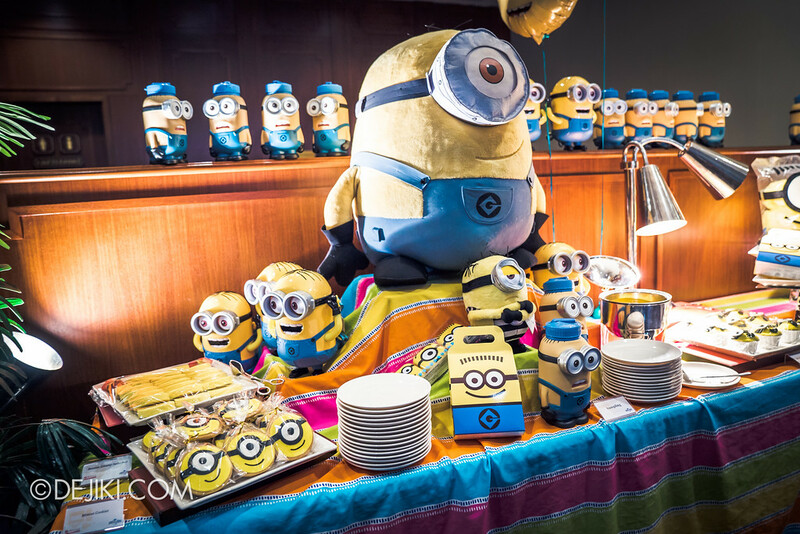 Are you good with Despicable Me Movie Trivia? 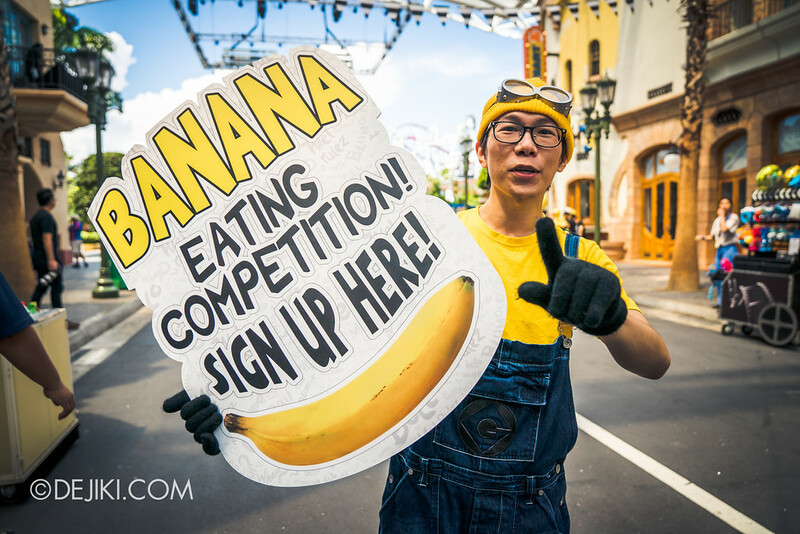 Can you eat a banana real fast, without using your hands? Then come on down to Rodney’s Rotten Game Show! 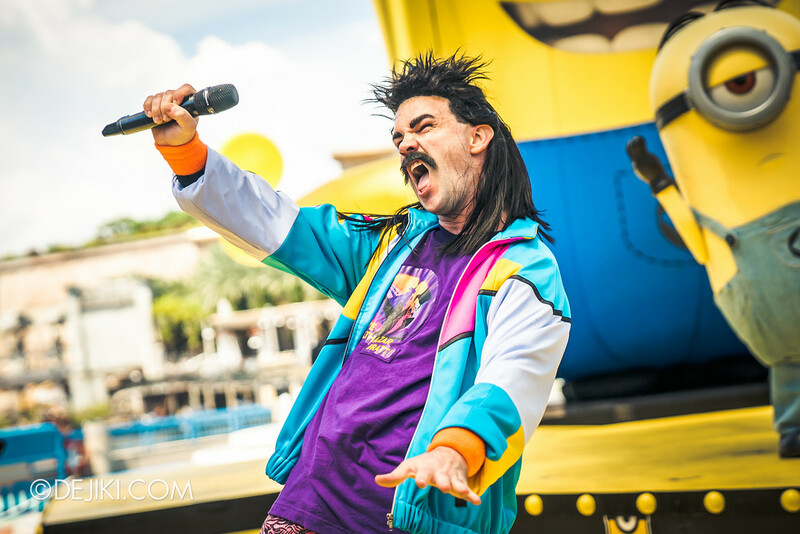 This is your host – Rodney Rotten, ultimate fanboy of villain Balthazar Bratt (Despicable Me 3), of this all-new game show at Hollywood Lagoon. 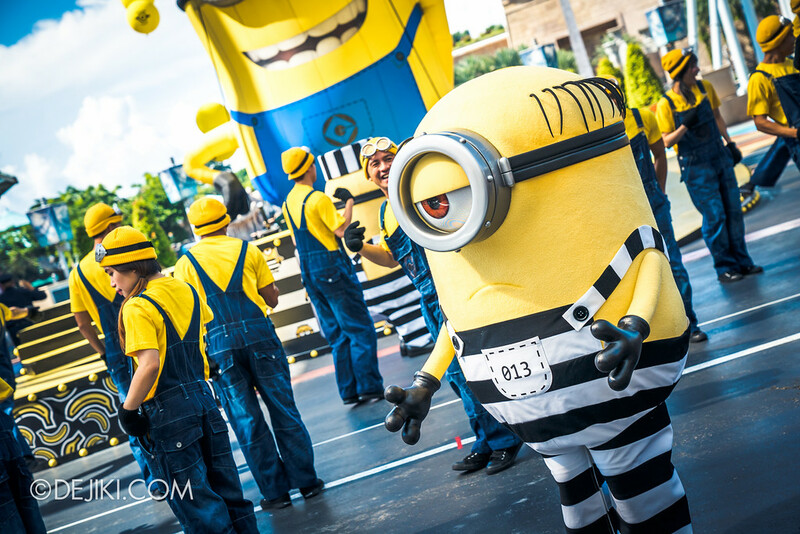 If you’re lucky, you can meet Felonious Gru too! No shame in bringing back the 80s! 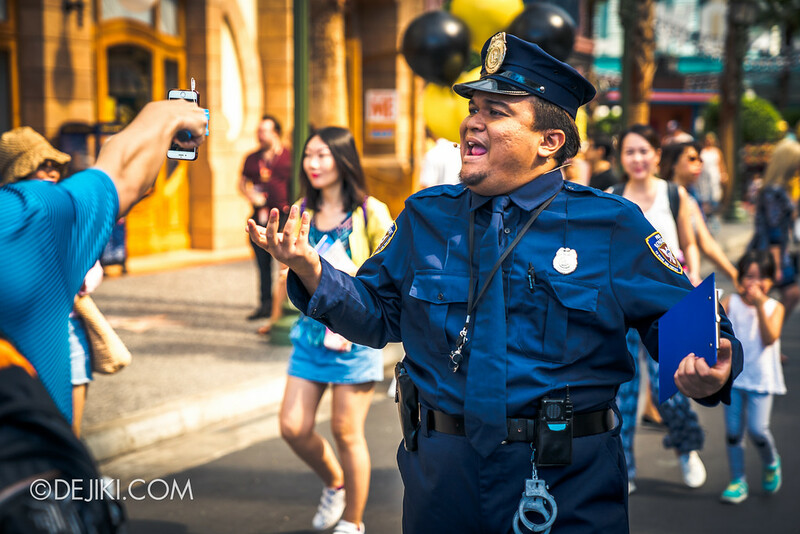 A bit of Super Silly Fun Land spilled over to the Hollywood zone of the park. 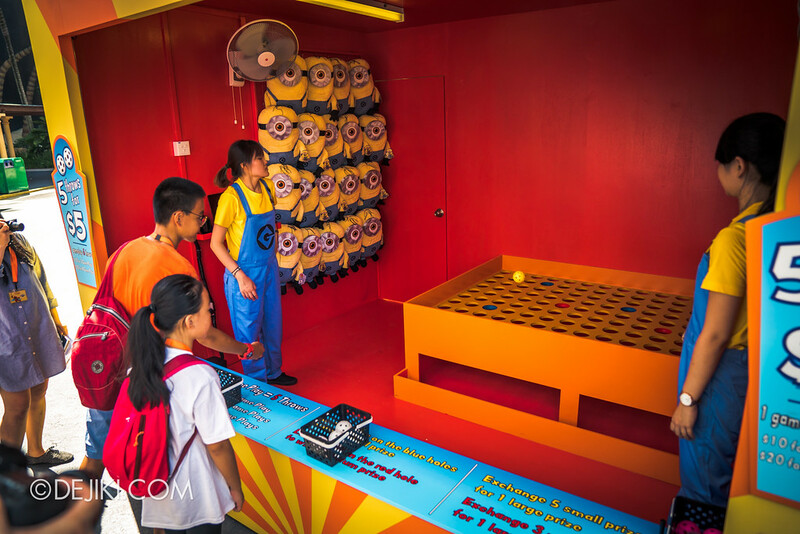 Visitors can enjoy games and activities inspired by the films here. 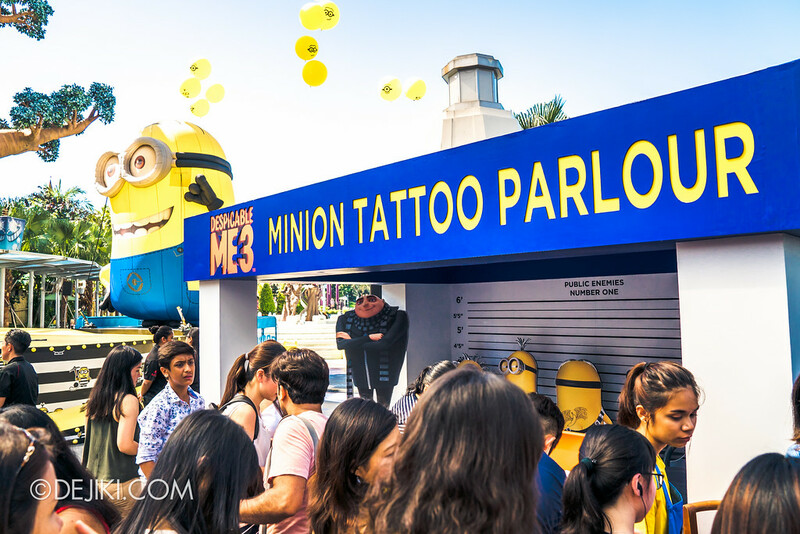 Toughen up with temporary tattoos at the Minion’s Tattoo Parlour. Grab 2 designs for $2 $1. Kids under 12 get one free tattoo. So sweet huh! Note: As of 21 June, the price has increased to $2 for 2 tattoos. Here are some samples of the designs available at the Tattoo Parlour. 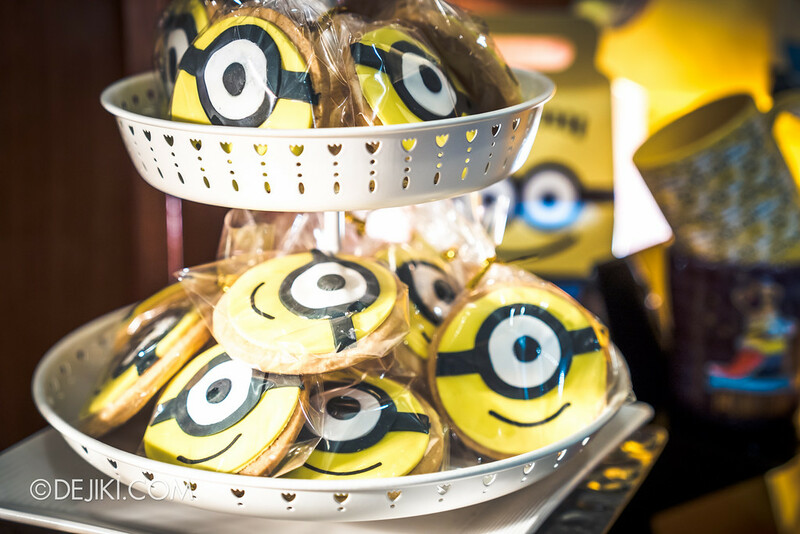 Get your snack fix with adorable Minion-themed food – from churros, cupcakes, cookies to ice cream, all banana and chocolate flavoured! 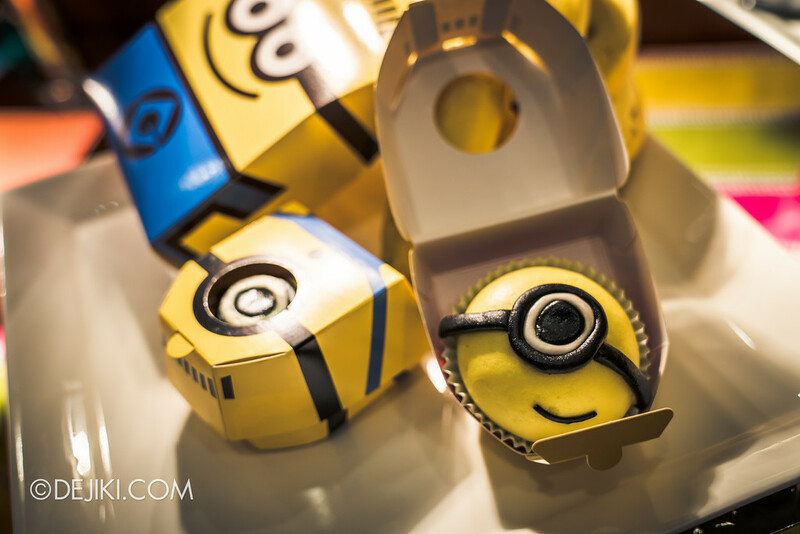 Minion Bun, Salted Egg Yolk Custard Bun (liu shar pau). 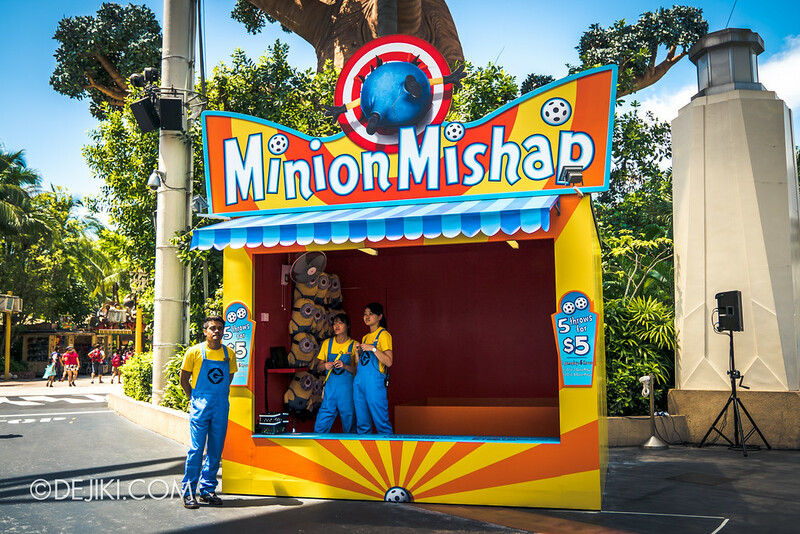 In a special Minion box from Universal Studios Japan! 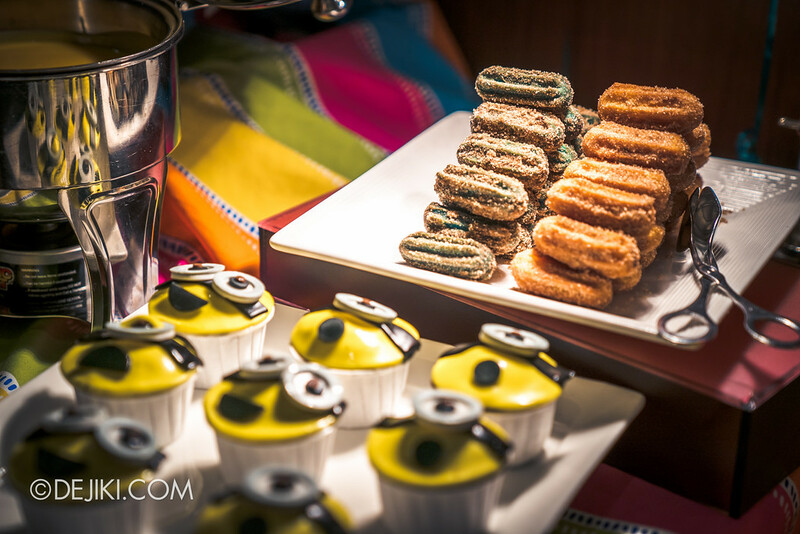 Minion Churros with Banana chocolate dip. Not enough fun? 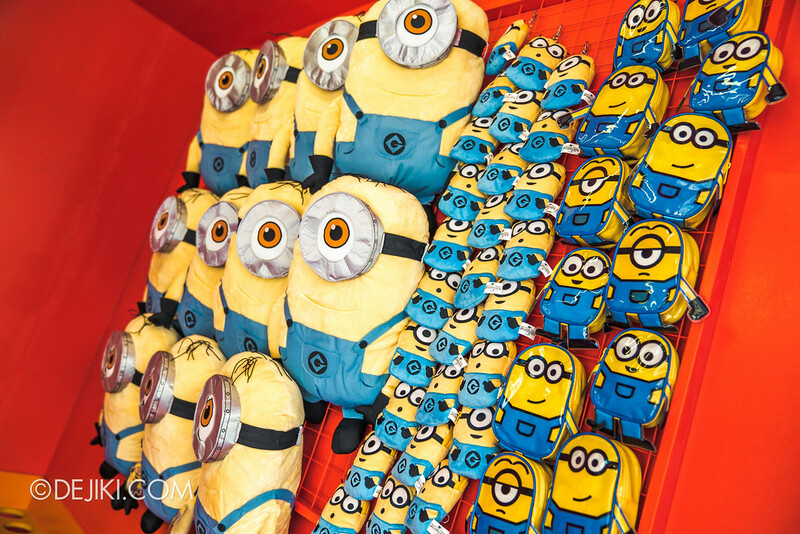 Test your skill at the carnival game stalls at Hollywood Lagoon Plaza! Each game voucher is priced at $5, but you can save more when you buy in bulk: $10 for 3 vouchers, and $20 for 8 of them. The prizes are not easy to win, although you can trade up smaller prizes for the bigger ones. 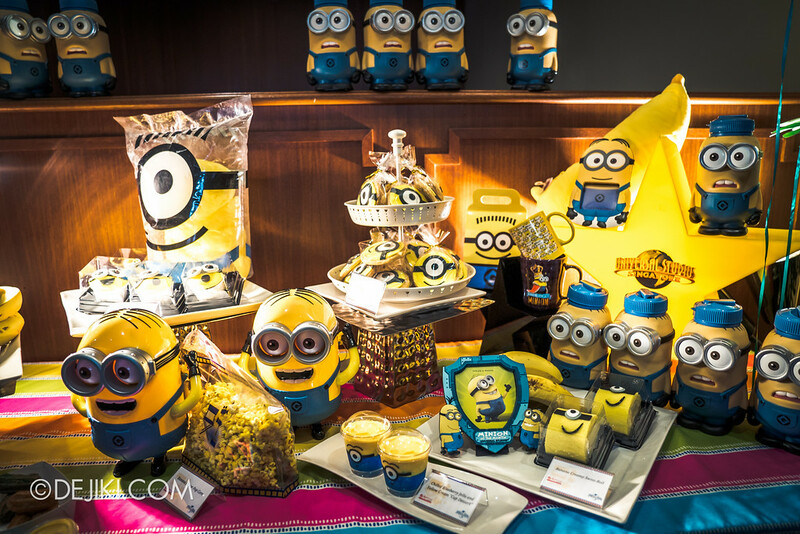 These items are no longer available for sale in the park’s retail stores. 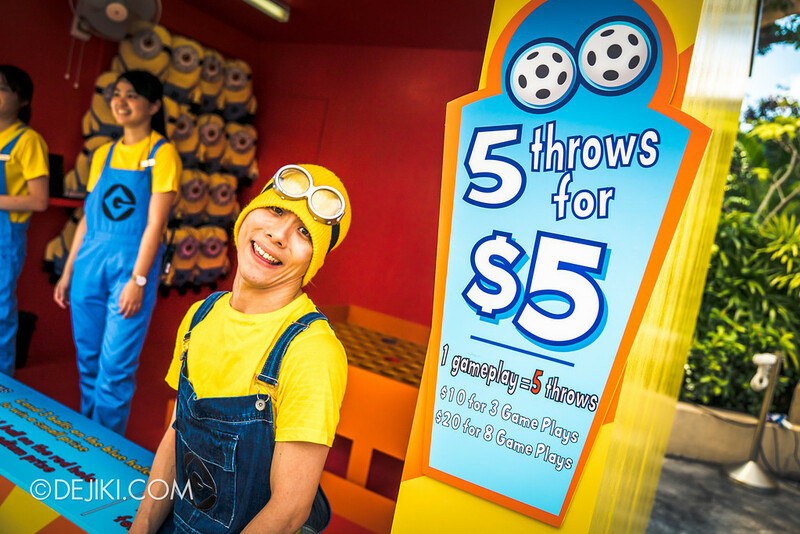 Minion Toss and Super Silly Space Killer (Yes, THAT one) are other carnival games which will be added later this month. 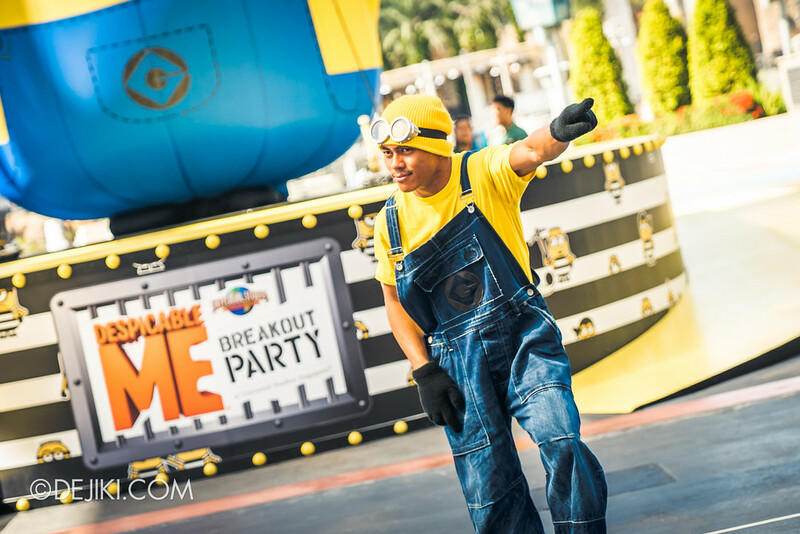 Will you be visiting the park to experience the Despicable Me: Breakout Party event? Let us know in the comments! At the moment nothing has been announced for AP holders. Perhaps much later, as this event is going to run for 2 months.